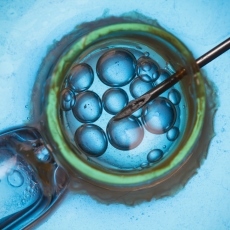 Assisted reproductive technology (ART) is used to treat infertility. It includes fertility treatments that handle both a woman's egg and a man's sperm. It works by removing eggs from a woman's body. The eggs are then mixed with sperm to make embryos. The embryos are then put back in the woman's body. In vitro fertilization (IVF) is the most common and effective type of ART. ART procedures sometimes use donor eggs, donor sperm, or previously frozen embryos. It may also involve a surrogate or gestational carrier. A surrogate is a woman who becomes pregnant with sperm from the male partner of the couple. A gestational carrier becomes pregnant with an egg from the female partner and the sperm from the male partner. The most common complication of ART is a multiple pregnancy. It can be prevented or minimized by limiting the number of embryos that are put into the woman's body. Article: Complications of Assisted Reproductive Technology. Article: Assisted Reproductive Technologies and the Placenta: Clinical, Morphological, and Molecular Outcomes. Article: Assisted Reproductive Technology and Epigenetics.